The health supplements retailer still looks sickly. Check out the latest GNC Holdings earnings call transcript. GNC Holdings (NYSE:GNC) has lost over 90% of its market value over the past three years as competition from superstores, warehouse retailers, and e-tailers drained its sales and profits. Several lawsuits that questioned the safety and efficacy of its supplements tarnished the brand's reputation, and the suspension of its dividend in 2017 eliminated one of the last reasons to own the stock. GNC's steep sell-off reduced its price-to-sales ratio to just 0.08 and its EV-to-sales ratio to 0.6. Bottom-fishing investors might be drawn to those bargain bin valuations, but the bears are still betting heavily against the stock, as nearly 80% of GNC's float was being shorted as of Dec. 26. 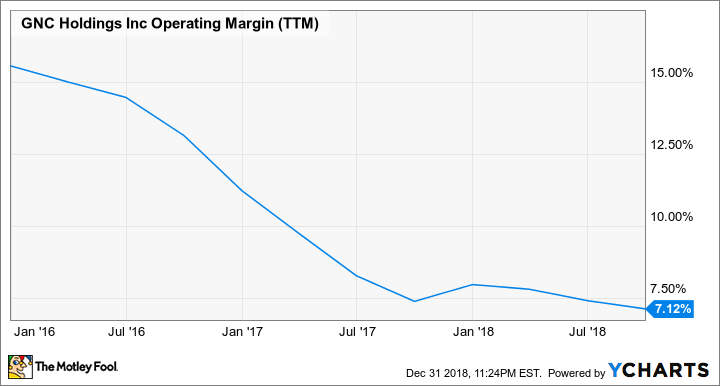 I've been bearish on GNC for a long time, but I still think it's important to evaluate the headwinds and potential tailwinds for this beaten-down retailer. After all, a single glimmer of hope at these levels might spark a big short-squeeze and a short-term rally. GNC sells its own vitamins and health supplements alongside third-party products at its retail stores, many of which are located in malls. This business model worked well when mall traffic was healthy and competitors like Walmart and Costco carried fewer supplements. But as mall visits declined and Walmart, Walmart's Sam's Club, and Costco offered more vitamins and supplements in cheaper bulk packages, GNC's business dried up. Here's how badly its same-store sales and top-line growth deteriorated over the past year. YOY growth; comps exclude international sales. Source: GNC quarterly reports. *Caused by the sale of its Lucky Vitamin brand. A rare bright spot was GNC's smaller international business, which reported a 1.5% increase in franchised comps last quarter. However, GNC's international revenues accounted for only 9% of its top line. Its revenue declines in the second and third quarters were exacerbated by the Lucky Vitamin sale in the first quarter, but GNC's negative comps indicate that its core business is still struggling. GNC's declining domestic comps were also exacerbated by the redemption of loyalty points over the past few quarters. But even excluding that impact, GNC's company-owned comps slipped 1.3% during the third quarter. GNC expects the impact from loyalty programs to be "negligible" in the fourth quarter and beyond, but it didn't provide any clear comps guidance for that quarter or the full year. Analysts expect GNC's revenue to fall 5% this fiscal year (which ended on Dec. 31) and drop another 2% next year. GNC's main direct competitor, Vitamin Shoppe (NYSE: VSI), which faces many similar headwinds, is expected to post a 5% sales decline this fiscal year (which ended on Dec. 30) followed by flat growth next year. To buoy its sales growth, GNC used big markdowns and loyalty program promotions to drive sales. This has caused its gross margin to contract over the past few years. 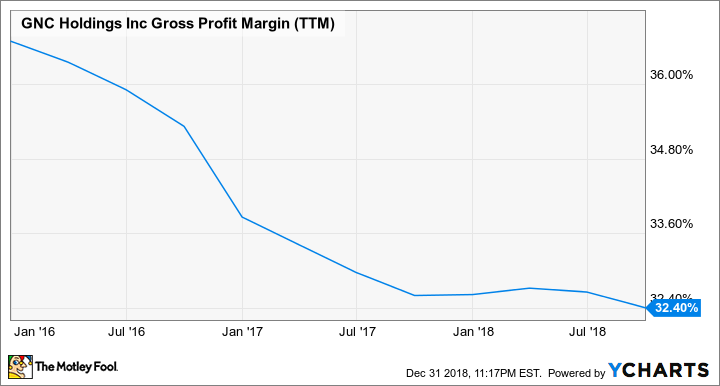 GNC Gross Profit Margin (TTM) data by YCharts. At the same time, GNC invested in the growth of its international operations, especially in China; its e-commerce platform (which only generated 7% of revenues in the US and Canada last quarter); and its loyalty program. Those moves were aimed at widening its moat, but they clearly weighed down its operating margins. GNC Operating Margin (TTM) data by YCharts. That pressure pushed GNC's bottom line into the red. During the third quarter, it reported a net loss of $8.6 million, compared to a profit of $21.1 million in the prior-year quarter. Analysts expect its adjusted EPS to plunge 65% this year, followed by a 13% decline next year. Vitamin Shoppe's earnings are expected to tumble 59% this year but possibly rebound next year as its margins improve. Instead of focusing on an international expansion, Vitamin Shoppe is mainly focused on clearing out its excess inventory, closing weaker stores, and promoting its expanding portfolio of private brands. There are plenty of reasons to bet against GNC, but the bears shouldn't ignore three potential catalysts. First, there have been plenty of rumors about GNC buying Vitamin Shoppe. A merger probably wouldn't solve the two retailers' problems overnight, but it could trigger short-squeezes on both stocks, pushing the prices up. Second, GNC sells its products on Amazon.com (NASDAQ: AMZN). It's a long shot, but Amazon might buy GNC to complement its acquisition of online pharmacy PillPack, as well as its rumored plans to launch a "Prime Health" service. Lastly, GNC could be acquired by a Chinese company. U.S. regulators recently approved a $300 million strategic investment from China's Harbin Pharmaceutical in GNC to launch a new joint venture, which could lead to bigger investments or an eventual takeover. Buying stock based on a potential buyout isn't a good course of action, though, as the buyout might not happen. But are the bears still right? GNC is still in serious trouble, and it's hard to see how its stock can recover without a buyout. I think its low valuation and high short interest levels will limit its downside potential at these prices, but I don't think it can stage a meaningful recovery in 2019.